Last week the tides were not the best to fish off the beach but a few fish were caught on gear off the jetty. I saw a lot of fish where we would normally be able to stand close enough and fish for them on a day with suitable tides. This is good sign as the tides from Saturday onwards are going to be good to cast to these fish. Make sure you take advantage of this, as the fish are fresh and it will get harder and harder the more you wait. Every time you cast to a pod of fish and they refuse it, change your fly for the next time you have a chance to drop your fly near them. Fishing the same pattern all day doesn’t help your chances. Also be sure to vary your strips according to the fly you have on. If you are gear fishing; try Blu Fox spinners and Gibbs crocks, if you are fishing deeper water off the jetty or a boat try buzz bombs in Blue Pearl, Pink Pearl and Perch colours. Pink salmon are coming soon! We are fully stocked on terminal tackle and flies for the arrival of pink salmon soon so come by the shop to stock up and get the latest report. The hot summer continues and the coho fishing is continuing as well and is getting hotter by the day. We have had some great catches of coho this week along the W. Van shoreline and it will only get better as more and more coho show up each week. There is not enough water in the Capilano for the fish to get up the river so these fish will be stacking up along the shoreline from Point Atkinson to the mouth of the Capilano. The hot lure for us this week was the white or UV white hootchy, 28 inch leader, and a UV flasher like Purple Haze, Green Haze, Purple Onion, or Green Onion. The other key has been speed. Troll fast. If you think you are going fast enough, kick it up a notch. These fish like a fast and active presentation. Eddie’s guest with their catch from the day! We have also been hooking some chinook as more and more Fraser chinook start to show up this time of year. We have hooked some chinook off the Bell Buoy as we often head to this area later in the day after we have done some coho fishing off W. Van early in the morning. The fish off the Bell are often caught in about 90-130 feet of water and for depths on the downrigger you want to be around 30-70. So if you fish 2 rods per rigger or you have multiple riggers, keep most of your gear in this area. Happy guests with their coho after a great day on the water! This fishery is all about bait. You want to fish a flasher with some glow tape on it and a teaser head that has some glow on it. We will run all 4 rods with bait as these mature chinook will respond to spoons or hootchies, but bait produces a lot more fish. So brine up your herring and anchovies and get the meat out! This fishery will continue the rest of July and into August and usually peaks around mid to late August, so it will still be a bit spotty right now, but if you put your time in you will get some nice chinook and most of them are reds this time of year. 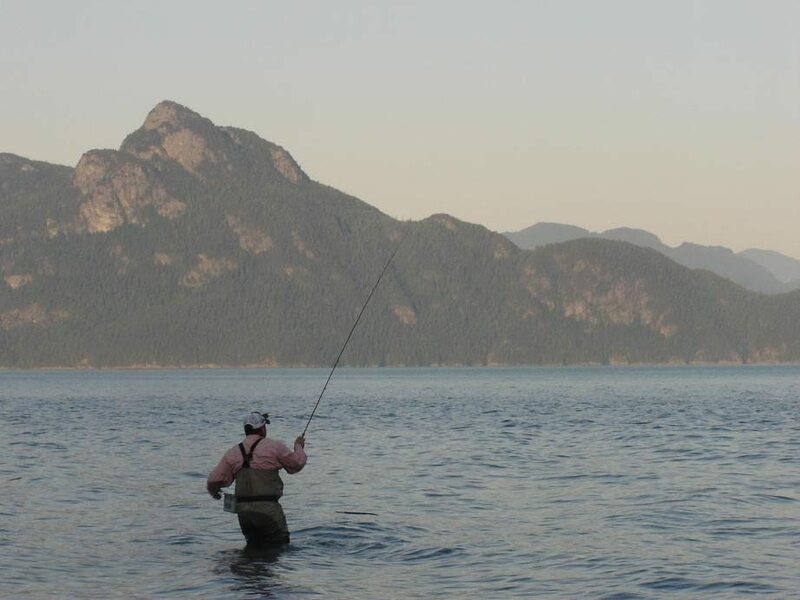 Howe Sound has been a little slow lately and we have seen some of the Howe Sound guides venture out to W. Van for coho and the Bell for chinook. That being said, some of the best fishing is this week and next week for chinook on their way up the Squamish, so it wouldn’t surprise us if there are some good days at Hole in the Wall in the coming days. Much like the chinook at the Bell, bait is the top producer and top depths in this area are usually in the 90-120 range.